Posted on Fri, Mar 9, 2012 : 6 p.m. 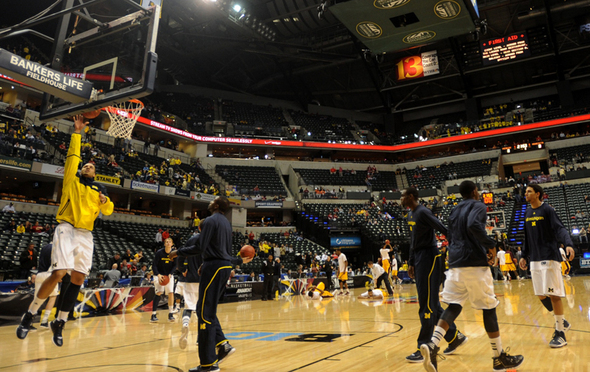 The Michigan basketball team goes through pre-game warmups at Bankers Life Fieldhouse in Indianapolis. The Michigan basketball team opens Big Ten Tournament play on Friday (6:30 p.m., BTN) against No. 10 seed Minnesota, which upset Northwestern on Thursday. The Wolverines, ranked No. 10 in the nation, are the No. 2 seed in the tournament. AnnArbor.com sports reporter Nick Baumgardner will provide live updates from Bankers Life Fieldhouse in Indianapolis via his Twitter account. Find them scrolling below. Sat, Mar 10, 2012 : 1:49 a.m. Sat, Mar 10, 2012 : 1:20 a.m.
Mich struggles versus height. 40 seconds to go, down by 3, Minnesota ball. It's still do-able but the deck is stacked against us. Sat, Mar 10, 2012 : 12:51 a.m.